Every child loves ice cream—so why not throw an ice cream themed party? There are endless ways you can incorporate ice cream into your party. From the decorations to the actual food, ice cream can be a versatile theme for your child’s birthday or other celebration. 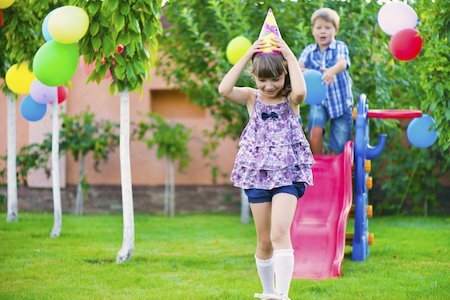 To make your party even more fun, we have compiled a list of ice cream themed games that you can recreate for your own day of fun. Keep reading below to find out! This classic kids game can easily be modified to fit your child’s ice cream theme. Rather than pinning the tail on the donkey, kids will pin the cherry atop the ice cream sundae. Blindfold the child, give them three spins, and have them feel around to pin the cherry atop the sundae. This can be a fun game for kids to watch their friends play and participate in. Ever heard of hot potato? Of course you have! This immensely popular kids game involves a ‘hot potato’ that is passed around a circle quickly for the duration of a song. When the song or music stops, the person holding the ‘hot potato’ is eliminated. This game can easily be recreated to fit into your ice cream-themed party. Rather than making it a hot potato, change its name to an ice-cold sundae. Have the kids pass around a bowl, filled with faux ice cream scoops to make it even more fun! Every kid loves competing for prizes. With a simple game of toss, you can create an interactive and fun event for all the kids to enjoy. Simply paint an ice cream cone on a large piece of plywood. Instead of painting the cherry, cut a large hole. Kids can toss bean bags from one side of the yard to the sign to make it through the hole. You can even incorporate different levels of difficulty by making a three scooped ice cream cone with a hole in each section. Reward points for each scoop and give away prizes to the kids with the highest scores. Ice cream will obviously be served at your ice cream-themed party, but have you thought of a how you’d like to serve it? Why not make it a game? Set up a sundae station filled with vanilla ice cream, and loads of toppings. Create a dice with different toppings on each side. From Oreo crumbs to gummy worms and everything in between, this die will make it fun for kids to adorn their sundae with a plethora of new flavors. With each roll of the die, the kids will find out their new, exciting topping to add on to the their personalized sundae. Relay races are a fun way for kids to compete in a fun and simple manner. Traditionally, party relay races are completed with a spoon and egg, balanced in the mouth. To make this ice cream themed, have kids balance a large ball atop an ice cream cone. They can race from teammate to teammate trying not to drop the ball.